That ever-present challenge seems to dominate the minds and hearts of ElliptiGO riders the world over as they train… How do I get faster? Having been training on the ElliptiGO for the last 8 years now, I’ve had my fare share of experience in this regard. I have needed to look into my speed for various reasons, sometimes for very clear reasons and other times for not-so-well-defined reasons. It probably makes sense to just share my journey as it unfolded and to let you decide for yourself which of those goals and experiences might be useful in your own circumstances (if you, like many others, are looking at ways of improving your pace). I didn’t really have any major goals when I first stepped onto my ElliptiGO 8S back in 2010. In the back of my mind I had wanted to ride across Britain from Land’s End to John o’Groats and to set a World record for that ride. That had been my initial interest when I had first started to explore the prospect of ElliptiGO training. 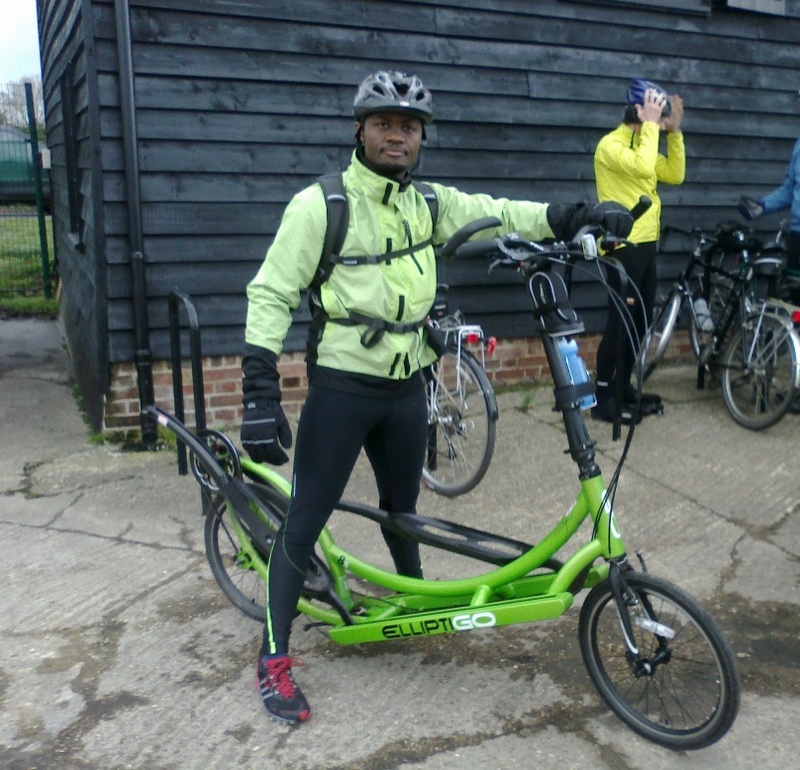 But when I got started I had just wanted to build the general fitness required to ride the bike well and to become a master of all the various applications of ElliptiGO training (as is always my goal when I take up any new exercise). So initially I just wanted to ride and explore and learn. I didn’t look towards the longer term future, or at any performance specifics at this point. I simply treated it a bit like my running training (which had been my main cardiovascular exercise over the previous 20 years leading to that point). And I went out on my ElliptiGO 3 times weekly, for about 45 minutes at a time, simply riding in a more-or-less straight line for 25 minutes and then turning around and trying to get back home just a little quicker than it had taken me to reach the turnaround point. I had done those sessions on the numerous local cycling lanes in Milton Keynes (known here as ‘Redways’) and I seldom varied my courses (so that I could compare my performances). Not much had seemed to happen with my pace in the first few months and I didn’t initially seem to get any faster. But in December of 2010 my buddy Stu, who was also new to the ElliptiGO himself (we all were new to it, the ElliptiGO had just been launched that year!) 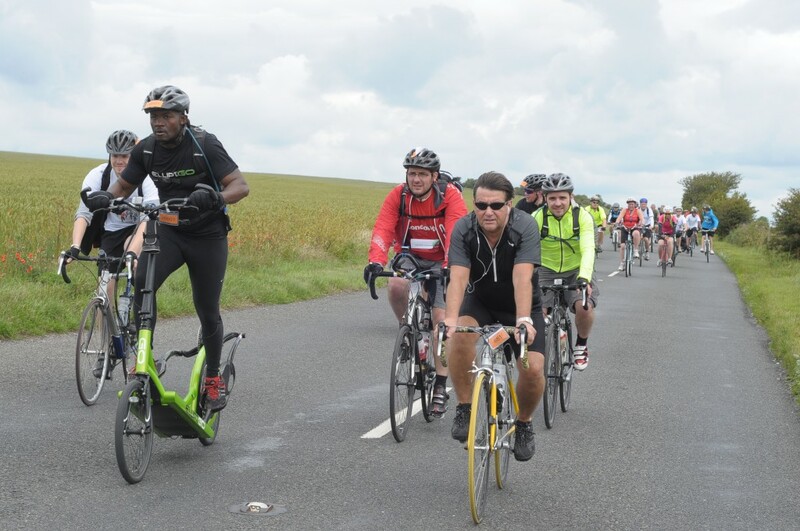 had suggested that we train to join the Century Club, a group made up of the first 100 riders to complete a 100-mile cycling event riding an ElliptiGO bike. Being experienced with running training I knew that launching into speed training from a low endurance base was silly and that it would be important to build up my overall endurance first. So, in January of 2011, I had begun to increase my weekly ride distances gradually (from about 8-miles per ride to 10-miles, then 12-miles, then 17-miles per ride). I’d told Bryan Pate (the co-founder of ElliptiGO Inc) what I was planning and he’d suggested I look to ride with cyclists to improve my road skills and my fitness. He (thankfully) had a good cycling background himself and had done a prior internet search and found a link to a local touring club – in my town! So he’d suggested that I joined them and I had reached out to them and been welcomed into their ranks. A touring club is the ideal bike club for most ElliptiGO riders because touring clubs are not all about speed. They ‘tour’ – which is to ride for the experience and for the scenery, as much as anything else. My first touring club ride would be 40-miles long and would be in the last weekend of January 2011. At the time my friend Stu had suggested that I step up from my 17-mile longest ride (and attempt 32-miles, riding with him) in order to see how I’d fare in a longer ride. It had sounded like a good idea, although Stu was a very fit ultra-marathon runner at the time – and my background was more in general fitness and martial arts training – meaning that there was likely to be a discrepancy between our endurance fitness levels! I had learned that energy flow is limited when your fitness is still building up and you have to fuel yourself quite well in order to sustain a very high energy output on a longish ride. I had also learned that you can develop your riding pace by simply riding more and more, especially when coming off a lower fitness base. I’d done my longest ride – by almost double – and for most of it I’d paced faster than I had ever ridden before. I had also learned that riding on main roads is a lot faster than riding on smaller bespoke cycling lanes and part of my enhanced efficiency and pace came simply from that aspect too. My next lesson and initiation came at the end of the month of January in 2011 when I had finally joined the cycle touring club for a 40-mile winter ride. It was cold and breezy, with a little drizzle or sleet falling and the grey-bearded ride-leaders had joked about how they always go out “…unless it’s snowing heavily or there’s black ice…” I’d found that attitude refreshing at the time… They were real die-hards, a bit like myself! What wasn’t so refreshing was the pace at which the ride had started. We had basically taken off at about 15mph pace – considerably faster than the 12mph I’d paced on the previous weekend (and about 50% faster than I’d ever ridden in my previous months of short distance training)! But I’d found it easier to hang onto the group than I’d expected. I was advised to stay nearer the back so that the other riders would shield me from the wind – and it had seemed to work early on in the ride. I’d also realised that if I rode in the highest gears all the time it was easier to ride fast on the ElliptiGO, despite having more pedal resistance. I was eventually going to learn this about the ElliptiGO. It is actually more efficient when the resistance is higher and the pedal cadence lower – which is the exact opposite to a conventional bike with a saddle (which allows you to save energy by spinning faster in the lower-resistance gears). To go further, faster on an ElliptiGO you must ‘grind’ in bike terminology (that’s use relatively higher gearing and a lower cadence). In fact, every distance has an ideal cadence on the ElliptiGO – if you want to ride at the fastest possible pace – and the longer that distance, the lower the cadence needs to be (or the higher the resistance needs to be, in other words). The ElliptiGO pedal cadence tends to be a lot slower than that used on a traditional bike at the same speed (I’d estimate my cadence varies between 50 RPM and 60 RPM in ElliptiGO training, on a conventional bicycle or exercise bike it’s more around 90 RPM). And the higher cadences suit shorter and faster rides. So an all-out 20-mile ride will require lower gearing and higher cadence than a relaxed but very long ride. For my longest rides I tend to use the highest gears, most of the time – especially on flat ground or downward slopes. But for my fastest rides I am not able to hold the top gear on flat ground (on an 11-speed or 24-speed ElliptiGO) and will use slightly lower gearing. I tend to use the 2nd or 3rd from highest ratios (on both the 11- & 24-speeds) for my fastest ride times on flat ground. I was becoming more and more concerned as the ride had continued for a solid 2 hours at that 15mph pace. Then we’d suddenly stopped, at a garden centre. There was a nice restaurant in the garden centre and all the cyclists had sat around for coffee and cake – or even big lunches. That’s another thing I had learned that day – cycling clubs love to stop for big meals (and those big meals can take a long time)! But on that particular day I was thankful for the break, because we’d covered 30-miles in about 2 hours and I was not sure I could have continued going like that! After the lengthy lunch break I was pleased to find that my legs had ‘regenerated’ and the afternoon stretch was comfortable for me. We’d continued cruising at about 13mph after lunch, probably slower because the guys were gorged on steaks and cappuccinos. That final stretch was fun because I’d finally shaken off the fear of possibly grinding to a halt and I had just enjoyed my newfound speed and had rolled back into town with a huge sense of accomplishment. It had been my longest ride ever – and it had also seen me put in my fastest riding pace to-date. I’d now learned that efficiency on the ElliptiGO is established my using the higher gears to reduce pedal cadence and I’d learned that there are huge advantages to riding behind other cyclists, despite their bikes being a lot lower than mine. I had also learned that the open roads allow a much greater riding pace than bespoke cycling paths, mainly because the bigger roads are straight and smooth, with more gradual slopes than the cycling paths running alongside them. And of course the main lesson learned was that in the first 6 months of training speed tends to increase without a specific effort needing to be placed on actual speed training. I was pleased with my progress at this stage and had continued riding with the cycling club on each successive Sunday, with the rides lengthening as the days had lengthened. I’d enjoyed that fast initial 2 hours on those club rides, but I didn’t enjoy the leisurely way in which the whole day was spent riding and stopping for food and drinks at cafes. Most of the guys in the club were older than me and didn’t have infant children like I did, so they were in no rush to get home – whereas I was missing my children and beginning to feel like the rides were robbing me of my weekends with my growing little-ones. We would usually leave town at 9am on the club rides – and for a 50-mile ride we’d often only get back to town at 3pm (because of the long breaks for meals – and socialising). I had calculated that in that same amount of time, riding at a similar pace, I could probably cover near 100-miles (if I just rode and didn’t stop at cafes for long periods). But I did appreciate all the skills I was learning from the bike club – and especially the crucial road safety and group cycling skills they’d imparted during the rides. Those riding skills I was learning are crucial for anyone who wants to ride far – or wants to ride fast – because you have less time to think when you are pushing yourself hard and it helps to just do the right thing (and to use an established riding protocol so that the people around you can predict how you will respond to any specific situation). That approach makes the whole group safer and I cannot stress enough just how important bike club riding skills are for fast riding and long-distance road riding. In my first few club rides I had noticed that it was reasonably easy for me to hold the group pace, despite being the only ElliptiGO rider in the group. But whenever we’d hit a slope the road bikes would seem to surge away from me in those early rides (and I’d then have to battle to catch up again when the road had flattened out). I’d also noticed that there would be stretches of road where the guys on road bikes just sat still and coasted with ease, but I still had to keep pedaling away furiously on the ElliptiGO in order to remain with them at such times. The ElliptiGO does not hold speed like other bikes do, it slows almost instantly once you stop pushing forward! You have to work a lot harder on an ElliptiGO to perform like you would on any other bike type. But that’s what most of us like about ElliptiGO training, it’s great for your fitness! Within a few weeks I was soon able to go up some of the hills faster than many in our club, so perseverance does pay off in this sort of speed training! I’d also noticed that riding at that fast pace just made the club rides more fun, more engaging. It’s hard to explain why, but I have since found that fast group riding is almost always more fun. I struggle with fast-paced riding on my own, but I get spurred on by a group and I find that I often need to ride in groups to put in my fastest training rides. That was certainly another lesson I had picked up, which I think applies to all high intensity sports and fitness training. Training in a group often helps you find that little bit extra – as well as making very hard training more enjoyable. After a couple of months of pace-riding with the cycling club 15mph had become an almost ‘standard’ training speed for me in rides up to 50-miles long. But I was training for a ride of 100-miles and by April 2011 I had felt that it was time to head off on my own, so that I could explore longer rides than the club were doing. So I had decided to increase my riding distance from the 52-mile longest club ride I’d done, to 70-miles. I had set off on my own one weekend in April 2011, riding along some nice-looking country roads without any specific route planned, just exploring the nearby countryside with the understanding that once I’d reached 35-miles I’d turn around and retrace my steps to make it a 70-mile ride. The pace had felt good for the first 35-miles and I had loved all the new scenery and discovering new places in the countryside that I’d never have seen if I wasn’t a cyclist. But after 50-miles of riding at 15mph I was struggling. Without the other bikers to shield me I was expending much more energy to maintain the pace and I had slowly ground to almost a halt, struggling along at about 9mph in the last 10-15 miles of the 70-mile ride. But the achievement of riding 70-miles had meant more to me than the brutality I’d endured to achieve it and I had continued to do the same thing, every weekend. I soon noticed that I was becoming stronger and stronger with each successive weekend of 70-mile rides and the struggle to finish would set in further and further into the rides (until I was only slowing from about 60-miles in – and would only really suffer in the final 5-miles). One day, around this time period, I had decided to try and test my short distance speed, immediately after a full-body workout (with weights) at the gym. I’d ridden 4-miles to the gym and done a heavy full-body workout. Then I thought I’d experiment and test my shorter distance ElliptiGO speed in a 40-mile solo time-trial. 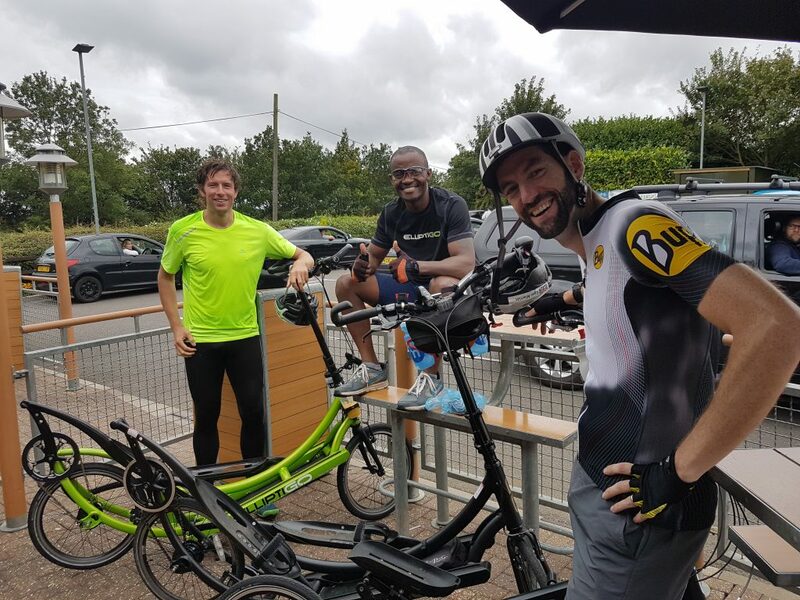 To my surprise I was quick on the ElliptiGO, despite the fatigue of a heavy weight training session prior to the ride, and it had been by far my fastest ride – ever. It was at that point that I realised that doing long rides at a fast pace on the ElliptiGO makes you really quick over shorter distances too. It’s a ‘double-edged’ sword though, because doing long rides fast always ends brutally (and it takes quite a lot of determination to keep up that sort of training regime). But the fitness rewards are significant if you can keep it up long-term. 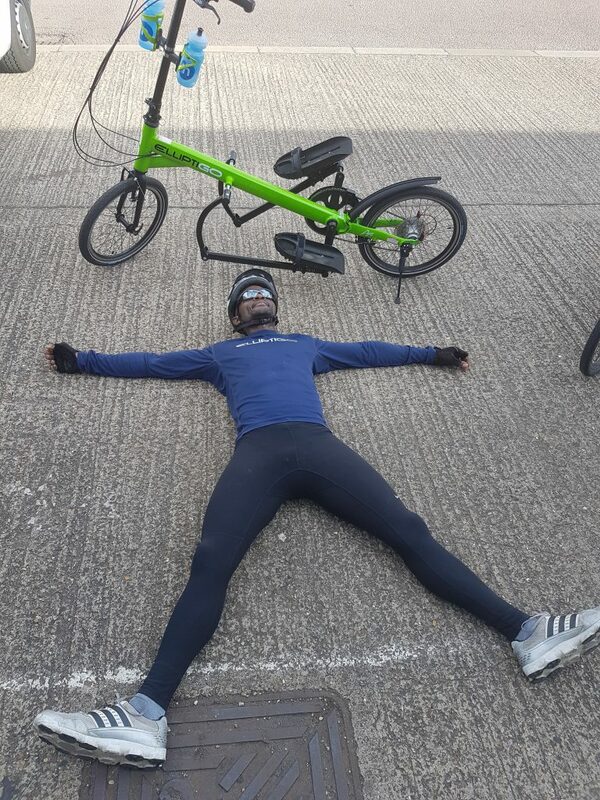 Because I was aiming to become one for the first few people to complete a century ride on an ElliptiGO bike my motivation was high at this stage in my life. I was willing to suffer through 5 hours of training every Sunday morning (and to finish each ride feeling like I would not reach the end). I remember MANY times feeling like stopping at the petrol station which as just 2-miles from home, with the thought of calling my wife Ivy to come and pick me up in the car (because I couldn’t face the final 2-miles of a fast 70-mile ride). And that fact alone probably tells you just how hard those rides actually were! Lesson: Resisting that urge to stop near the end of fast and tough long rides was (and still is) one of the hardest things I have had to do in training – and I think it has truly shaped my character for completing very tough or very long rides. I’d found the exploratory aspects of the rides really rewarding and I had continued to extend my range up to 90-miles, often planning some sort of reward for myself at the end of each ride. For instance, I’d plan some of my rides to end 90-miles from home ridden in a straight line – and I would meet my wife and family for an early dinner at a nice restaurant at the end of those rides. Then we’d drive back home with the bike on the roof rack of the car. And I’d sometimes search for interesting destinations (places which I knew I would never have a reason to visit) and I would then plan to ride there and meet my family at those destinations for a meal. As I got smarter I’d look at the wind direction and once in a while I’d plan a ride with a tailwind all the way, so that I could maintain an extraordinary pace for the full 70-miles (and still work hard, but cover the distance really quickly). Then I could be picked up by my wife at the end of the ride. That was a good way to make my training more engaging for the rest of the family (and it was a good way for the children to see just how far I was riding)! I got stronger and stronger by doing these fast long rides. But the rides always beat me at the end (and I’d struggle to finish them). But that struggle to finish made me really fit and when I’d slow my pace I could go for very long distances in great comfort. I finally managed to eventually scrape through my first century ride, along with my buddy Stuart – in June of 2011 – and we were both inducted into the ElliptiGO Century Club as a result. Stu had a great century ride that day and mine was fun, but something of a roller coaster (with me getting lost twice and struggling with the big hills towards the end of the ride). But I had unwittingly got myself caught up in ultra-distance riding and had continued to train for ever-increasing distances from that point on. You might think my ‘flirtation’ with speed training would have stopped as a result of my long-distance ‘infatuation’ but the opposite was actually true. As time had gone on I had realised that doing long rides slowly made me really slow, regardless of what distance I was riding. Slower rides were easier and less intimidating – requiring much less motivation on my part. But slow training also saw me lose my good pace really quickly and I was no longer able to ride alongside guys on road bikes after I had stopped the fast long rides in 2011. Celebrating with Tom and Stu after a well-earned 10-mile PB in 2017! For a time I was okay with being slower and doing longer and longer rides, but then it got boring after a few years of long slow rides (which also took a great deal of my day to complete). I didn’t enjoy being out for many hours in order to get fit from doing slow long rides. That was why I’d left the touring club in 2011. I didn’t want to ride all day. It had appeared that somewhere along the way I’d somehow lost my direction, so to speak! So I had started to experiment with speed training again, in 2015. This time around my goal was to mix the nice slower riding with harder and more intense bursts of pace. So I chose the 70-mile distance of old as my training standard (by this point it wasn’t unusual for me to ride up to 100-miles in training, so 70-miles was a significant ‘step down’ in training distance). But I’d aimed to ride hard whenever I reached a hill in my training rides (and to then ride easy again when the hill had been passed and the road had flattened out again). I’d noticed that I was pretty weak on the hills, but reasonably swift on flat ground. So by working on my hill pace I was not only getting more out of my workouts, I was also increasing my overall speed and getting a better workout, which was improving my main riding weakness (which was hill-climbing). And that speed improvement seemed to carry over to shorter distance rides too. 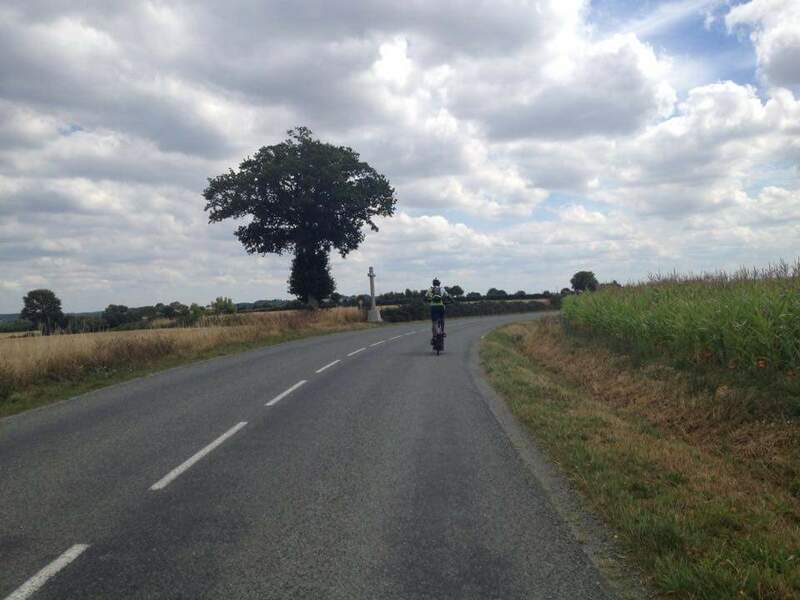 Yet I also got my best ever ultra-distance performance (in the 765-mile/1,230km Paris Brest Paris Audax) after using this ‘mixed’ speed training approach. I still think that Paris Brest Paris ultra-distance performance was a real ‘proving’ of the speed training approach for longer distances. From that point onwards I’d shortened my training distances even further and by 2017 instead of the 70-mile weekend rides I had reduced my weekend ‘long’ rides down to 50-miles. But there was still a ‘twist’ to these even shorter rides, actually making them harder than the 70-mile sessions, or the 100-mile sessions of old. That’s because in the middle of every 50-mile weekend ride I would set up a timed speed training session, done at a measured fixed intensity(using my heart rate monitor to ensure the effort was ‘honest’). This speed session done in the middle of the long ride was intended to make the ride ‘count for more’ in relation to the fitness gains from the ride, because it would be an all-out sprint. I couldn’t do this sort of training on my own, it was just too hard to sustain, so I planned to rendezvous with faster (and younger) ElliptiGO riders, or even friends who used road bikes road bikes. They would help push me to my absolute limits and during many of those training rides I actually set numerous lifetime bests – lifetime bests done in the middle of a longer ride! My preferred time-trial distance, when done in the middle of my longer rides, was 20-miles. But we often did ‘murderous’ 10-mile speed tests as well – or even 35-mile speed tests – just for variety. I will admit the most intimidating time-trial distance for me in those types of rides was 10-miles, because it was virtually a sprint (and I was barely able to hold on until the end). It was scarily intense trying to keep up with my training buddies in the 10-mile sprints and I don’t think I ever finished any of them strongly. I was always completely depleted at the end and barely hanging on for the final half mile! The 35-mile distance was also tough and always ended in failure too. I think 20-miles was just about right, although that too ended in failure every time! Lessons? I hope the theme is obvious. In high intensity speed sessions it is tough and it always ends in failure, regardless of the distance. But that 10-mile ride (or 20-mile ride) is probably tougher to complete than 100-miles at a comfortable pace. And the reward of doing this is instantaneous. It is an incredibly rewarding feeling after a short and intense maximum intensity threshold training session. Especially when done with a well matched group of riders. And the endorphin rush after those sessions is impossible to describe in words, it needs to be experienced to be fully understood! But the rides are not tough ll the way through, there is a balance (because the section before the speed session in one of those ‘joined-up’ sessions is fun and social – and so is the part afterwards). The unpaced part of these rides can be done very slowly and that is fun. There is no pressure. I can stop. I can chat. I can just ‘tour’ in the warm-up. So a typical session could be 15-miles easy, then 20-miles all-out, and then another 15-miles easy (for a total of 50-miles). Not dreadfully long, but those sessions are sufficient to get you into shape for cycling events of all distances (and they get you into the best general cardiovascular shape possible). I finally got to test out my conditioning from the 50-mile combined speed sessions in August 2017 when I completed a 25 hour hill repeat session in an endurance challenge called “Everesting” (during which I climbed the height of Mt Everest in a brutal but rewarding ride with my buddy Alan). I had felt strong all the way through that ride despite doing just one 50-mile weekend training session (with a high intensity speed ride in the middle) as preparation. In 2017 I sometimes did no training at all on the bike during the weekdays, just the one weekend session. And that weekend session was good enough to get me into shape for both short and long distance rides because it had a mix of both the required conditioning criteria (time on the bike and intensity). Because the ‘mixed’ speed sessions are shorter, there is still room for socialising during or after the sessions (unlike when I would do the longer slower sessions with the cycling club that I used to ride with back in 2011). So in 2017 my training buddies and I had set up ‘traditions’ for our hard rides, such as having a nice cappuccino or fast-food meal at the end of the speed sessions (before splitting up and all going on our separate ways). We’d often just meet for the speed sessions and then we’d all disperse again afterwards and each ride home alone. But the social part of those sessions had carried a lot of value for me and made me look forward to doing them. Ride long distances, fast. The building up of your overall endurance also builds your strength and speed on the ElliptiGO. The trade-off is that you will really suffer at the end of each ride (if you are doing it properly)! And the way to use this approach is to ride both hard and far, once each week, and to keep trying to extend the distance without reducing the pace. If you have genuinely ridden hard you should always ‘crawl’ to the finish. It is a humbling experience and builds your character, but it is also difficult to sustain without a big motivation to do so (such as a tough event which you are training for). I find it hard to do this long-term, but I do still use this approach seasonally, to add some variety and also, like I said above, to strengthen my character and my resolve. Ride medium to long distances and be sure to surge up all the hills. This is called hill interval training and it will make you very strong. Again, you are likely to have very little left in the tank towards the end of each ride, but it will work wonders for your hill climbing (and for your overall speed over short or long distances). I got my best ever ultra-distance performance off the back of this style of training. Consider inserting a threshold time-trial pace session in the middle of a medium to long ride. Ride at warm-up pace for at least an hour. Then do a timed speed session, aiming to go as fast as is possible for the chosen distance. You should finish unable to ride any further – and you will need a short break before continuing to ride at recovery pace after the speed session. To add a ‘twist’ you can also try to ‘move’ the speed session to different parts of the long ride. It is toughest when the speed session is done nearer to the end of the long ride than right in the middle. Whatever you do and wherever you place your speed session, always give yourself at least 30 minutes for recovery riding after the speed session is done. Don’t finish riding immediately after the speed session – it helps to clear out waste products by getting the circulation going again in the legs and flushing out the lactic acid which has built up during the high intensity session. That’s my speed training ‘toolkit’ in a nutshell. I hope some of these insights and experiences will help you build your own ‘toolkit’ for speed training and I hope that one day you’ll be able to say, as I do, that speed training can be fun if done right! Just remember to keep it varied. It is often said: “Rome wasn’t built in a day…” and it is also often said: “There are many roads to Rome…” So let’s get out there and ride them all!